Enraged over the death of his father, King Xerxes of Persia assembles a mighty force to conquer Greece and get revenge. Meanwhile, humanity’s arrogance has angered the god Poseidon, who now expresses his displeasure through natural disasters. And as Angelo struggles to keep his kingdom together, his duties cause a growing rift between him and his beloved wife, Amara. 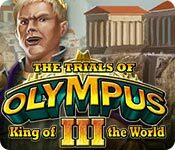 The Trials of Olympus III: King of the World is rated 3.4 out of 5 by 19. Rated 5 out of 5 by SixSigma from I will not be defeated! I really liked this game. The game started out fairly easy and progressed to more challenging levels. Levels 5-17 to the end were very challenging and hence, the title. I literally spent several weeks on some of them but prevailed! I highly recommend this game if you want a challenge. Rated 5 out of 5 by denniann2 from a great game a great M3 game. you play as angelo, a former God, from olympus that has been banished to earth to live as a human due to trouble he got into. he rebuilds greece and fights enemies off. his efforts do not go unnoticed by the Gods and they visit him from time to time. Rated 5 out of 5 by XFreak from BIGGER, BOLDER, BETTER than before! What can I say? Its getting better every sequel. Most epic storyline ever for match3 genre. I love how dev added a historical event like king leonidas and xerxes! Good job. It confirm that 7 wonders of ancient world is made by Angelo, not an alien :) say it, statue of zeus in olympia, artemis temple, mausoleum, collosus, even hanging garden of babylon.... I just love the game, its rich! The only cons is an ordinary classic match3 gameplay. But its not a big deal, at least for me. Just try it! Rated 5 out of 5 by pennmom36 from Storyline 5 Stars-Being Able To Differentiate The Tiles 4 Stars In the first episode of The Trials of Olympus, we followed Angelo, an archaeologist who constructed magnificent palaces for the Gods. He fell in love with a mortal, Princess Amara, angering the gods who then exiled him to live his life on Earth as a mortal. In the second episode, the young newlyweds have angered Ares, the god of war. (probably the last god you would want to anger) Ares journeyed to bowels of the underworld to release the mighty Titans. They became allies of the "Order of Ares" an unstoppable force determined to destroy Angelo, and perhaps even Earth itself. In this final episode, King Angelo's people are prospering, but their arrogance has led them to believe they no longer need their gods. They are wrong, and Poseidon has released a wrath of godly proportions. Now the Persians are evading Greece to seek revenge for the death of their King Darius, and to make matters worse, Angelos' relationship with Queen Amara has weakened. Can Angelo, now a mere mortal, appease the Persians, Poseidon, and he beloved Queen? I will say this, the storyline of this trilogy are fantastic, the music is surprisingly relaxing, and the gameplay itself is fun. Once again, I was slightly disappointed with the tile elements on the board because the elements were either too similar to tell them apart from one another quickly, or perhaps there were just too many different types all at once. Whatever the reason, I found it difficult at times to find matches of 3 or more identical elements, much less being able to spot all of the gold tile borders you must make matches over. 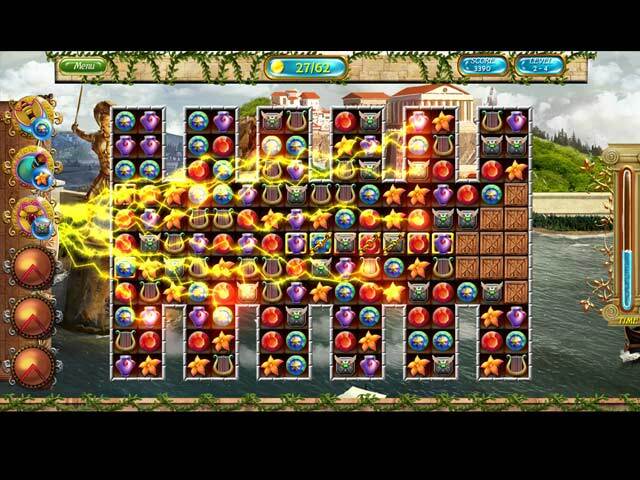 You can play in a Timed or Relaxed untimed difficulty mode, you must swap tiles to make matches of at least 3 identical tiles, and you must clear all gold cells and the required number of resources. As you match elements, the mana meter will fill and allow you to use the bonuses. A Golden Axe clears a single tile, the Potion Bomb clears a 4 tile range, and the Magic Pendant collects all of the same tiles you choose, eventually there will be 6 total Bonuses to choose from. 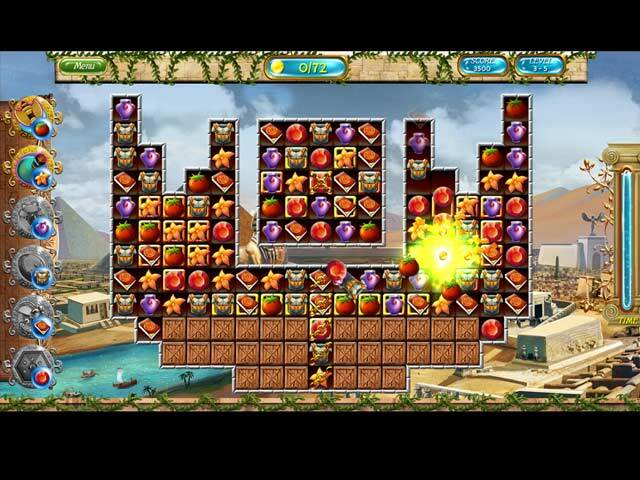 Matches of 6 tiles will earn you a Sun icon on the board to destroy tiles with a single click. Some tiles have chains or double chains that require matches of the same tile that the chains bind, once or twice for double chains, then again to clear the gold cell. Spiders need to be destroyed by making matches under them or they will build webs on several tiles. Some icons have bubbles around them and the image inside is constantly changing. You must click on the bubble to pop it before you can make a match, but you can wait for the desired image to appear before clicking which can help you win. After each level, you will get the opportunity to build buildings that appease the gods or Queen Amara, after all, Angelo is an architect. This can be a challenging and frustrating Match 3 game because the tiles are so hard to tell apart, the boards just seem too busy at times. This is a decent Match 3 game with a fantastic storyline, but it still doesn't hold a candle to my beloved Cradle of Rome series, enjoy! Rated 5 out of 5 by cajerleia from Fun match 3 game! I was given the chance to play this game trial before it was released and enjoyed it so much I am buying it now that it is here. You won't be disappointed with this game. It is excellent! Rated 4 out of 5 by kerith90angel from A decent M3, try the demo! Based on completed demo I liked many things about this game. I felt some areas have room for improvement and it could be ultimate in its class. Like the game, The Voice of Heaven (my favorite M3 by this DEV)... the mechanics are pretty much the same with this one. The basics that most M3 have are here and there is a building feature you earn currency for. In both these games, you have 6 upgrades you work toward and you match certain tile icons to refill each upgrade as the game progresses. The upgrades are then used to help clear the board. Relaxed mode does justice for people that like to fast match, like me, where you need to collect items to refill your upgrades quickly as you clear the tiles on the board. 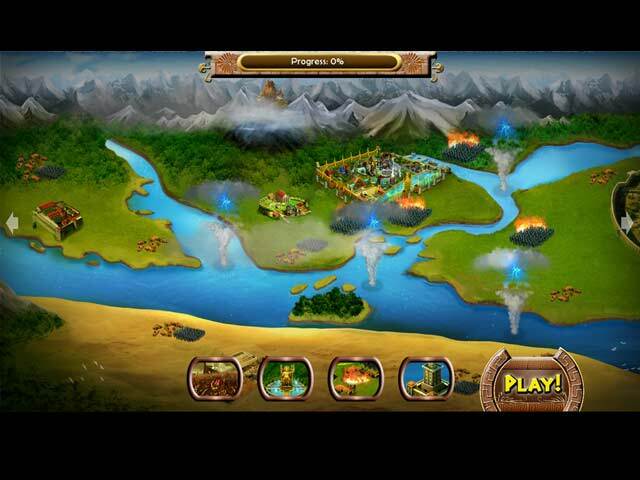 It is also geared to people that enjoy limited moves, in options, if you prefer a more concise matching game. I loved the fact items were moving beside the play grid, such as sailing ships and flying birds. I also loved that the building screen had moving items such as flowing water, etc. Many of the other M3s now a days seem to have a static background building screen with no moving parts; so I loved this one felt more detailed and involved which made the game feel like they put way more time and money into it than a lot. This game also gives you enough money to buy new items pretty much every level or so. I absolutely loved that about this game because so many of the M3 don't give you enough $ to work with....like life :) I wasn't a huge fan of what you get to purchase though. The buildings and items seemed too small. I play on a large monitor and this would be even worse on a small computer. The match board seemed a good size for me and I had no issues with that. A few things I would tweak to perfect it would be: - The gold rims around the tile, instead of an entire color over the tile. It made it hard to locate where they were and especially at the end of the level to finish the board. -The bombs don't blow up enough tiles and they need a larger boom imo. - Finally, I wish the DEV would change the sound effects between the M3 games they put out. And discontinue sound of match 5 ding- in this game, altogether // It's usually a M4 sound in their other games) Many of this DEV M3 games have the same sounds and effects. My favorite M3 by this developer is The Voice from Heaven. If you enjoyed this game, maybe try the BFG demo for: Hero's of Hellas 3- Athens My faults with this game are minor technical things and I do recommend trying it out to see if you like it too. Rated 4 out of 5 by tutortime from A bit hard to complete for 3 stars Liked the game, but it was very hard to get 3 stars. In fact, it was hard to get 1 star sometimes. Great game for your free game coupon. Would not have purchased it without the coupon. Rated 4 out of 5 by 041KERRY from Side Icons As with number 2, this one has the same problems. When matching 3 icons on the left hand side, if the mouse goes over the edge, it activates the extra's icons on that side. All of a sudden you find lightening or reshuffling happening when you didn't want it too. Can you please move the game board further to the right and make the extra's icons smaller. This is very frustrating. The actual history of the story and the level of difficulty I found very interesting. Thoroughly enjoyed it. Are you doing a number 4 or starting another similar trilogy. Eg. Egypt. Rated 3 out of 5 by Cherubabies from You need extra-good eyesight for this Game! Two of the tiles are almost identical so it's hard to distinguish them on the board. Also, the gold frames are VERY HARD to see on the boards, unless you rotate the boards and then it shows you where the gold frames are. This is the only way I can see all of them. Why so hard? I would have given it a much higher score if it wasn't for these issues. Otherwise the Game is enjoyable and the scenery is very nice, although building options would have made it even better. I don't recommend this Game if you have poor eyesight! Rated 3 out of 5 by tholmes2 from Not Bad The music I found annoying after a while, so I turned it off. The story was good, I liked it and the I like the fact it has voice over so one does not have to do a lot of reading before getting into the game. The play was alright, but not something I would rush out to buy, I would consider buying it if I had a free credit. I would still recommend the game though to people who really like match 3.